WASHINGTON—Saying the long-overdue gesture was a step towards atoning for the space agency’s past transgressions, NASA issued a formal apology Wednesday for the 1969 genocide of the moon’s native population. 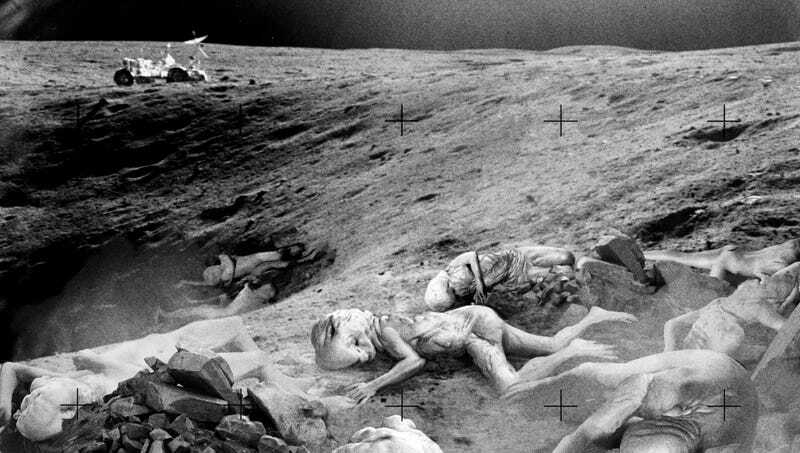 “The time has come to recognize NASA’s detestable role in the massacre of the moon’s original inhabitants,” said NASA spokesperson Natalie Warheit, adding that the blood of countless indigenous moon natives would forever be on the organization’s hands. “When we first set foot upon the moon, we found a thriving and peaceful civilization that welcomed our astronauts as friends and even worshipped Neil Armstrong as a god. Shamefully, we exploited their trust by slaughtering thousands, indirectly killing even more by exposing them to Earth diseases against which they had no defense, and then burying them all in mass graves by the Mare Serenitatis basin. NASA apologizes unequivocally for these atrocities.” At press time, NASA had also issued an apology for its role in toppling the democratic government of Neptune during the Voyager 2 mission.